Autumn has become a very busy time for Andrews Automation Ltd with our facility in Goole being a hive of activity building and testing pallet handling systems for three clients located across the UK. We have recently completed an installation for a global market leader in e-commerce at their distribution facility in Doncaster, South Yorkshire. 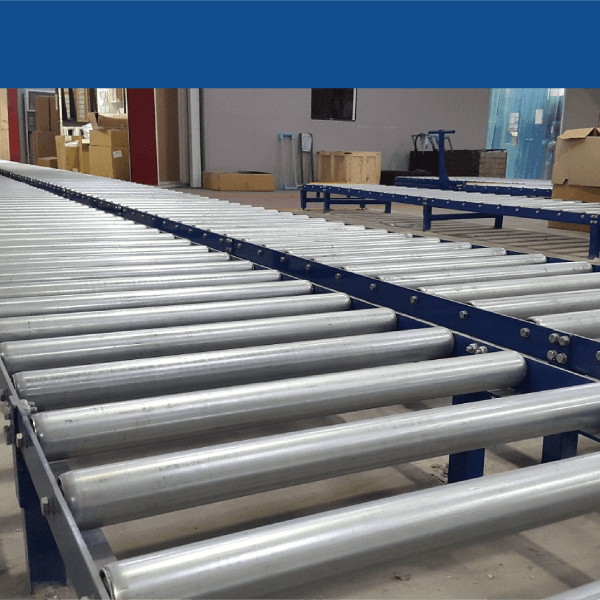 The project included three phases: Phase 1 was to remove and re-locate their existing powered roller conveyor to better suit operational requirements. Phase 2 was to install a new Interroll powered roller conveyor line to handle inbound shipments; and Phase 3 involved the supply and install of an overhead waste cardboard ‘dunnage’ conveyor to transport waste card and paper to the compacter unit at the end of the building. Most of this work needed to be completed quickly during non-operational times to minimise the impact on tight operational schedules, so preparation and the need to pre-build system modules was imperative. 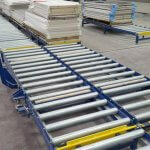 Also completed recently was an installation of over 200 metres of our new gravity roller conveyor beds at a door manufacturing facility near Barnsley, South Yorkshire. The system also required five transfer car systems and a rotating loading station. 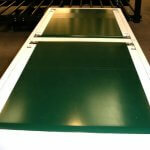 The newly designed system incorporates a simple, easy to use flip stop facility for effective pallet control, adjustable legs to accommodate uneven floors, and is supplied in modules ready-built to minimise the impact on operations. As the gravity conveyor modules arrived on-site already built up in-house prior to our arrival, installation took just 6 days for the entire system. November sees the installation of two of our robot palletiser systems at a distribution facility near Paisley, Scotland. This is the final two systems from an order of seven which includes a light-weight in-feed conveyor, feeding customer tote bins into a palletising cell. The robot, complete with its bespoke pneumatically operated gripper head, gathers up and stacks totes before a heavy duty pallet conveyor transports the loaded pallet out of the cell, ready for FLT collection.